BATON ROUGE, La. 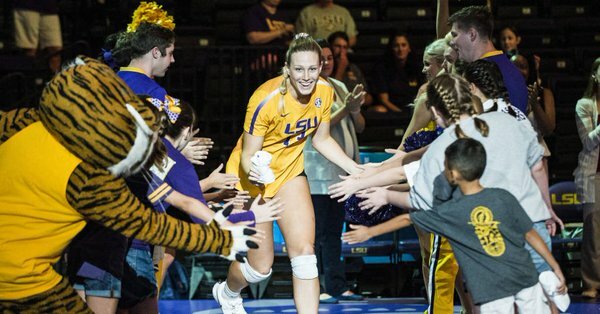 – After ending last weekend on a high note with a sweep of Oakland, the LSU volleyball team will look to continue that momentum into this weekend as they travel to Dallas for the SMU Doubletree Classic. Head coach Fran Flory is in her 21st season at the helm of the LSU volleyball program. The winningest coach in school history, Flory has led the Tigers to NCAA Tournament appearances in nine of the last 13 seasons. LSU goes into the weekend 3-6 record after going 1-2 in the Michigan Challenge last weekend. The Tigers fell to RV Colorado State and then-No. 20 Michigan in three set, but ended the weekend on a high with a sweep of Oakland. Taylor Bannister, a 2017 All-American, has led the Tigers in every match this season. She finished the weekend with 40 kills, average 4.44 kills per set, earning her a spot on the Michigan Challenge All-Tournament Team, her second straight tournament honor. On the year, Bannister has 134 kills on the season, averaging 4.32 kills per set. She is hitting .223 and has a total of 147.0 points on the season. Raigen Cianciulli continues to be the anchor in the back row. At the Michigan Challenge, she led the squad with a total of 30 digs, averaging 3.33 digs per set. Freshman Whitney Foreman stepped up on defense last weekend, finishing the Michigan Challenge with a team-leading 17 total blocks. She averaged 1.89 per set. She also was second on the team in kills with 21, averaging 2.33 per set. LSU is out-hitting and out-blocking its opponents. The Tigers are hitting .199 on the season compared to their opponent’s percentage of .195. LSU blocks 2.32 balls per set, while allowing its opponents to block 1.68 balls set. The Tigers’ 2.32 blocks per set, ranks fourth in the SEC.